Huna Huna Beach Resort formerly called Monte Carlo was built on the side of a cliff overlooking the sea, and offering a view of the Camotes Islands in the distance. 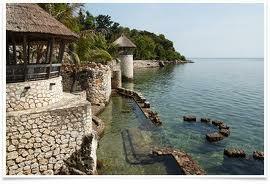 The owner successfully achieved his goal of combining Filipino and French Riviera styles of architecture together. The days were filled with swimming in the sea and laying in the sun. The evenings offered us seaside meals on the veranda, and a gentle breeze keeping the mosquitoes away. The moon was full and provided us with ample light for dining under the stars. The tiki torches burned in the background. There are twelve rooms at Huna Huna Beach Resort. Six rooms are air-con and are adjacent to the seashore in a single building. The non-air-con rooms sit on the top of the cliff, overlooking several payag (small nipa huts where you can enjoy drinks or meals anytime), the air-con rooms, and the sea. 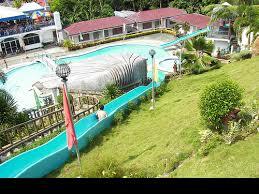 Imelda Aroma is a beautiful quaint little water park in the municipality of Catmon just off to the North of Cebu. The water park looks like it occupies a small area because the one of the pools and half of the rooms are located on top of a mountain. The place isn't exactly the 5 star quality in my opinion, but it's a fun place with 3 different kinds of swimming pools that are apparently sourced from a spring, although it is still heavily chlorinated. The first pool is designed for kids. It's only about 2 and half feet deep and has 4 slides in the middle where kids can play. My daughter just swam here for hours and hours. The 2nd pool is called the "lazy river." It's a nice stretch of water that is located almost atop a mountain the water goes down through this really long slide that connects it to the 3rd pool. This slide is no less than 10 meters long, and to me that's pretty long. My daughter was pretty excited to go down in it so I went along. It didn't fare well for us though and I have the wounds to prove it. The last pool is much bigger and much deeper with the shallow side starting at 3 feet. My daughter had a hard time since she was just learning how to swim. They also accommodate guests who want to stay overnight. We had a room that cost about Php 2,000 for 2 people. It can fit up to 5 people but you'd have to pay for the additional mattresses. This room also had a free plated breakfast. You can also enjoy videoke at Php 5 per song, if you into that and their canteen/ restaurant is open practically 24 hours. Imelda Aroma is also called Royal Vista Water Park by the way, if you're searching for it on the internet. This water park isn't for those who want a luxurious vacation. It's more suited to budget travelers who want to save up for an adventure in the province. 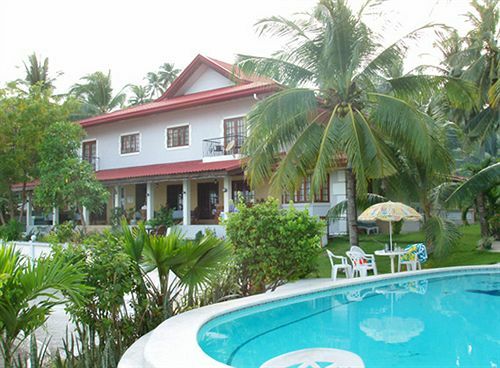 The Las Flores Country Guest House and Restaurant is brand new and located in the beach-side village of Flores, Catmon, north of Cebu City, Philippines. This small hotel sits on the beach, but since it is made up of brown sand and pebbles, it is not swimmable. This Mediterranean-villa-style two-story hotel has 10 large rooms surrounded by lawns, palm trees and the sea. On-property activities include an outdoor swimming pool and a badminton net. Guests can relax in the large guest lounge, and meals are served on a terrace overlooking the sea. Guests rave about their home cooked food. Amenities include cable/satellite television, air conditioning as well as windows that open. Daily newspapers, bottled water and welcome basket of fruit are complimentary. Near the hotel is the local hot springs/waterfall and golf courses. The town is tiny, but it houses the ancient, imposing San Guillermo Church.